This healthy, sweet chicken salad is perfect for a warm summer day and is packed with nutrients to keep your kiddos fueled during the day. With lean chicken, fresh spinach and a touch of sweetness from orange juice, this nutritious dish will satisfy your kiddos taste buds AND tummies! It’s also one of the many healthy recipes we serve in our schools as part of our GrowFit initiative. 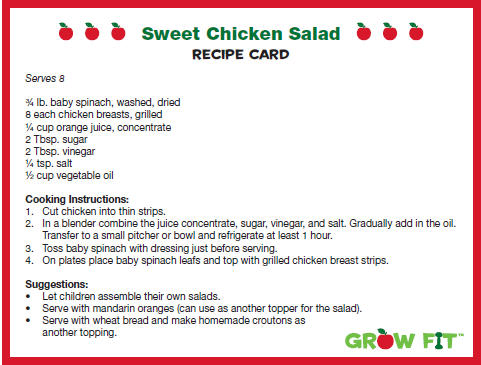 Click on the recipe card below to view a printable PDF containing four recipe cards that you can share with your friends. Enjoy! Want to view more healthy recipes here on our blog? Then check out our “Recipes” tab here.